06.21.2006 - I visited my friend Matt in Massachusetts, and he brought me to one of his attic cleanout jobs. 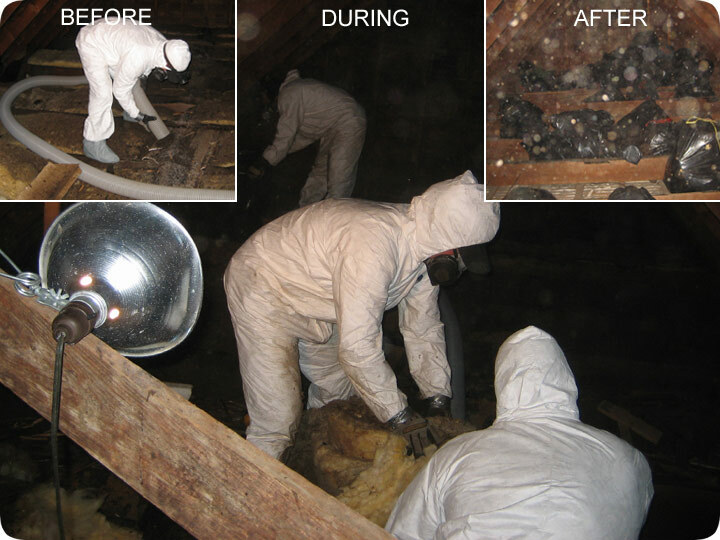 This attic was filled with bat droppings, or guano, due to an infestation of Big Brown Bats. It's important to remove the droppings, because they not only smell bad, but can grow mold over time, mold that can cause lung diseases for the inhabitants of the house. The insulation in the attic was also sub-par, so Matt decided to remove all of the droppings and insulation, clean the attic, and add new insulation. I helped out on the day that we removed the droppings and insulation. In the first photo, to the upper-left, we see Matt using a 4" vacuum hose to vacuum out all of the droppings and insulation. The hose runs through the house and outside to a very powerful industrial strength vacuum unit. The only glitch was the occasional clogging of the hose with BAT insulation paper. In the middle photo we see Matt and his helpers rolling up the bulk of the insulation, which was easier to remove by hand than with the vacuum hose, which kept clogging. In the photo to the upper-right, we see many bags filled with soiled insulation. After all of the insulation was removed and the attic was vacuumed clean, the next step is to decontaminate the attic. After that comes the insulation replacement. Matt uses a similar method and machine, but this time it's a long hose that blows insulation into the attic. The blown-in loose fill insulation does a better job of overall coverage than the rolled-out BAT insulation. I wasn't around for the insulation replacement project, but I heard that it went well. Do it yourself: Visit my Attic Decontamination page for tips and advice. You should not kill bats if you find them in your home or around your property. Bat colonies are protected, and attempting to poison them is illegal. Bats will not do much physical damage to your home aside from leaving piles or waste wherever they roost. This accumulation of feces can create a potent smell and will eventually result in the growth of dangerous mold spores. Humans can get a life-threatening infection called Histoplasmosis from animal feces. Despite the issues with bat droppings, bats are very beneficial animals to the environment and do a world of good in controlling the insect population. Disregard the myths about bats being blind and flying into women?s hair. A bat may fly frantically if trapped or confused, but the animal is not going to attack you for no reason. If you have a bat in your home and are not able to easily catch it with a net or a Tupperware container, you should call and have a professional come and remove it. Bats will bite, especially if they are injured or scared. Because of the high incidence of rabies in these creatures, you should never handle one without protective equipment.